I was excited and looking forward to making this week’s French Fridays with Dorie recipe. And… I love lychees (I have eaten kilos of them this summer). Yes, I know there are no lychees in this cake however the three ingredients were now linked in my mind and this cake was going to be awesome! The cake is made mostly of almond flour so the texture is moist and delicate. The recipe calls for rose syrup and rose extract. My chances of finding either were slim, so I used a good quality rose water and the flavour came through beautifully. 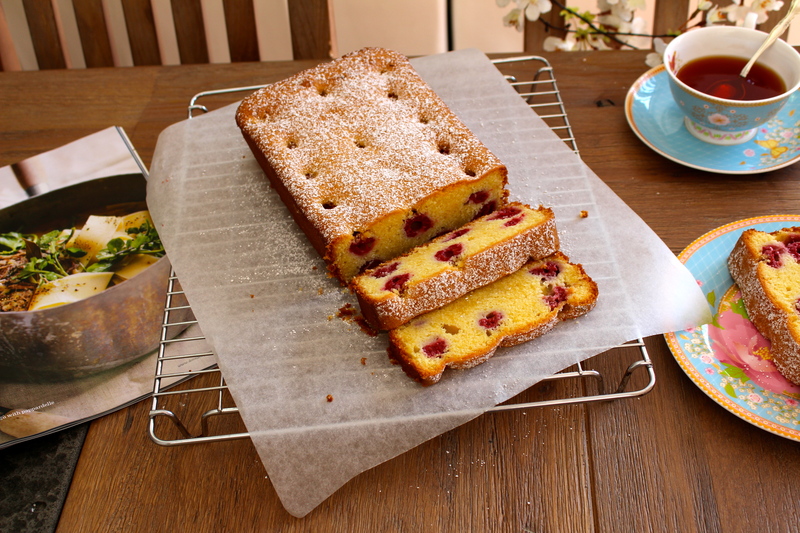 To be honest, I liked the taste and texture of the cake so much, I wouldn’t have minded the loaf plain, without the raspberries. I am looking forward to catching up with the rest of the French Fridays with Dorie group and see what they thought of this week’s recipe. Tags: almond, baking, cakes, cooking, food, french food, french fridays with dorie, rose water | Permalink. Hey, your cake looks awesome! Sturdy and the raspberries are in place, unlike mine! Wonderful pics! It is a great plain cake without the fruit and syrups, I agree with you. Did you use the lychees? I will add some next time, I do want to know what the trio of raspberries, rose and lychees taste like. The cake is gorgeous and the rows of raspberries perfect! Are those little holes at the top where you dropped i the raspberries? It looks so neat and tasty. eliminated but I guess that would be changing the name. Great job and the photos are lovely. AAwwwww…your photos are so inviting. Beautifully done. Your cake looks perfect. Now I see another Awwww in your comments…so I must be correct! Perfectly done! So glad to have you back!!! Sanya, nice to see you this week. I love the little dimples in the top of your cake! I’ve always wanted to try making Turkish delight, so that might be how I try using up some of my BIG BOTTLE of rose syrup. The dimples in your cake look very pretty, Sanya. This cake was good, wasn’t it. I think it would be fun to play with the flavours, as Cher suggested. Sanya, what a very pretty Ispahan Cake – it looks perfect with that cup of tea. Nice to see that you are back – always enjoy your posts and your fabulous photography very much! Lovely photo! I agree that the cake would be delicious without raspberries as well. Your cake looks lovely – we really enjoyed this cake too. Your cake is just lovely and I am so happy that you enjoyed it! Your cake is so pretty – it’s almost glowing! Did you do anything special? I also love the look of the confectioners sugar. OMG, your loaf turned out perfect! That is one gorgeous looking loaf cake, Sanya. I would call that picture perfect. Like you, I loved, loved, loved this delightful cake. it sorta adds a little sophistication to my dessert repertoire . I didn’t add anything like confectionary sugar or glaze but wish I had sprinkled on a liitle CS, like you did. Although I don’t think you need it for taste, it just makes the cake a little more special. I cannot figure out what is in the copper pan to the left of your cake in your last lovely picture. That looks interesting. Nice Post and am wondering if your boys like it.